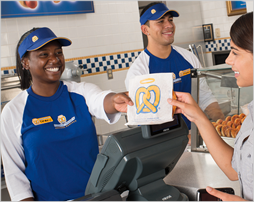 Chestnut Land Company is the #1, largest and fastest growing domestic franchise partner of Auntie Anne's Soft Pretzels and has recently added franchises of Carvel Ice Cream to its family. We have 92 locations in 16 states throughout the Midwest and along the Eastern Seaboard. We're proud to say this is a great place to start a career, grow professionally, and make a difference. It is a place where everyone's voice is heard, where fun is the rule rather than the exception, and where you are recognized for your efforts and achievements. We've created a well-defined career progression and pride ourselves on internal promotion. We never know where our next store might open, making the possibilities for advancement and adventure endless! We have a strong passion for pretzel making and are committed to customer service and satisfaction. Our dedication to make a difference has formed strong partnerships with Alex's Lemonade Stand to battle childhood cancer, as well as the Children’s Miracle Network and the Food Donation Connection. You don't have to reach upper management to be rewarded here! You can also print and fill out an application if you are meeting with a recruiter. Click here! Then check out our current openings below! Now is the perfect time to join the Chestnut Team and build your career with a fast growing company. We can promise you this: your hard work will be rewarded, your efforts will have impact, and you WILL have fun every day! Chestnut Land is an Equal Opportunity Employer.